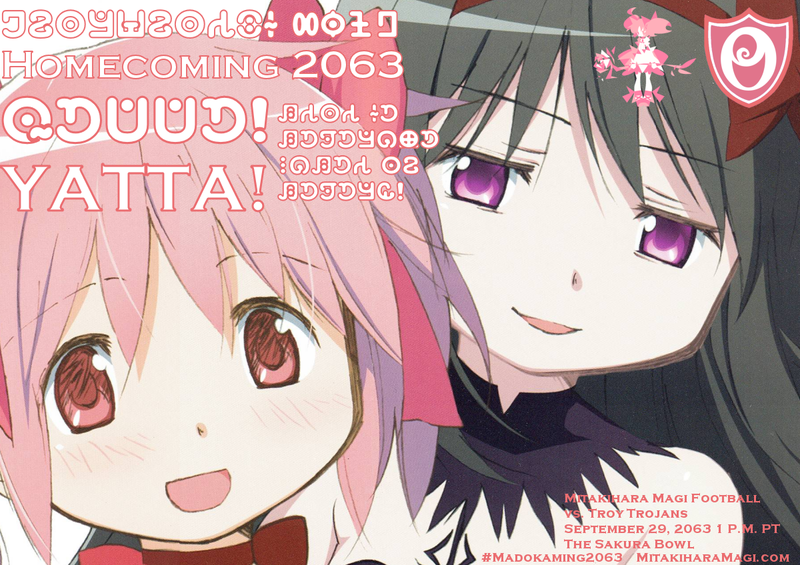 Mitakihara Magi Football: Mitakihara Homecoming 2063: Yatta! This week, Mitakihara University is celebrating a tradition that goes back five decades plus: it's Homecoming Week. This year's theme is "Yatta!." Ikaruga Saito, once again, is this year's Homecoming Chair. Saito is a sophomore Asian Studies major and is the daughter of Mitakihara University Chancellor Honoka Kaname. "It's an honor to be chairing this event once more on behalf of the Mitakihara University student body," Saito said at an event promoting Homecoming Week at Madoka Square. "This year's theme is Yatta!" which means 'All Right!' is Japanese. It's a way of saying 'A Job Well Done' to yourself and to those who have achieved something meaningful. We are success-driven students and we are judged by our merits and how well we have done the work to learn the important skills necessary to function in this growing society. "The motto for this year's Homecoming is 'Kimi ga kawareba sekai mo kawaru,' which means, 'If you change yourself, you will change the world.' This is a motto that is relevant to every student at Mitakihara University. We take pride in finding new ways and solutions to make the world a more livable place. It's a reputation that we salute and honor at this year's Homecoming." A number of events will take place leading up to the Homecoming Game against the Troy Trojans on September 29, 2063 at 1:00 p.m. PT/4:00 p.m. ET. The game will be televised by City, TVA Sports, ESPN, NHK and BBC. Following the Women's Volleyball game vs. British Columbia, the 2063 Mitakihara Magi Football Team will be introduced. Speeches by head coach Tatsuya Kaname, offensive team captain Ricky Cojuangco, defensive team captain Damien McQuillen, athletic director Nagisa Momoe and university chancellor Honoka Kaname will be made. Pack a picnic and set up a tailgate with your friends prior to the Mitakihara-Troy football game. The Madoka Tailgate Area will be located inside Stade Sakura Bowl Gate 10. Cars can park here for $40, payable on-side. Tailgate is permitted for 2 hours prior to kickoff and for one hour following the game. Cheer on the Mitakihara Magi as they take on the Troy Trojans. A block of tickets for Madoka Homecoming is currently reserved through the Mitakihara Athletic Ticket Office. Tickets are required and cost $30 each, children ages 12 and under are free. Tickets can be purchased directly through the Mitakihara Box Office by phone at (250) 4MADOKA or online at the box office website.